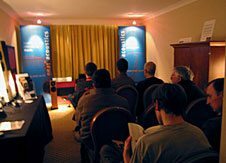 The Bristol Sound & Vision Show (24th – 26th February) was a tremendous success for Neat Acoustics. 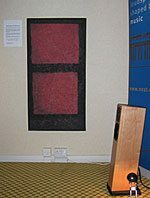 Using Naim electronics, a James Audio Mark 6 mains conditioner and ‘Decorative Art Services’ room tuning devices, the tiny Motive 2 loudspeakers made a fantastic sound, producing fine resolution and delivering a surprisingly prodigous bass performance. On Sunday morning, to our immense surprise and pleasure, we were awarded the BFA award for the best two channel demonstration at the show – for the second year running. This award is based on several factors as well as sound; the appearance and atmosphere of the room; how informative the graphics and promotional material are; the quality of the music and the volume level at which it is played. The Neat room was also a Katie Melua-free zone, which probably helped!